Engineering fitter, maintenance engineer and general manager. Son of Frank Smith, a Colliery Fireman and Deputy at the Victoria Colliery, Deane. His mother, Alys, was a shirt maker and seamstress. Served Engineering Apprenticeship at Horwich Locomotive Works. Studied Mechanical Engineering at Horwich College of Further Education. Represented East Ward on Westhoughton Urban District Council 1971-74. Represented Hulton Park Ward on Bolton Metropolitan Borough Council 1973-95. Member of several Committees including Finance and General Purposes. Member of Joint Local Government Committee. Employers Representative on Provincial Council. Served on many Committees and Sub Committees but mainly on the Management and Finance Committee and its Sub-Committees and the Education Committee and its Sub-Committees. Was Vice-Chairman of its Development Sub-Committee. Chairman and Member of several School Governing Bodies. Chairman & Member of various Local Government Tribunals. Represented Bolton on several outside bodies. Unveiled Civic Trust Plaque outside the Wellsprings Buildings June 1990. Inaugurated Cable Television and cut first turf to cable up Bolton June 1990. Opened Senior Citizens Bungalows at Violet Avenue, Farnworth June 1990. Unveiled Europa Nostra Award Plaque at the Market Place June 1990. Opened new Salvation Army Citadel, St George's Road, Bolton June 1990. Opened Barton Grange Garden Centre on reclaimed colliery site June 1990. Inaugurated first Tourism Tour of Bolton Centre July 1990. Opened Johnson Fold Credit Union Registered Office July 1990. Opened the Families Centre at Salvation Army Citadel Oct1990. Opened Heywood Park Adventure Playground November 1990. Opened the Ring & Ride Control Centre November 1990. Inaugurated the Westhoughton By-Pass December 1990. Opened new premises for Cancer Research Fund, Newport Street December 1990. Officiated at the re-opening Little Lever/Farnworth Hall Lane Bridge December 1990. Opened the newly refurbished Central Library January 1991. Signed Bolton Health Charter on behalf of Bolton MBC January 1991. Opened Community Centre for the Elderly in Commission Street February 1991. Inaugurated the Refurbishment Scheme for Oakenbottom Road March 1991. Opened newly refurbished Benefits Office at Elizabeth House. Opened newly refurbished Regents Park Golf Club May 1991. Opened the new Hollywood Bowl Bowling Centre, off Bradshawgate October 1990. Opened the newly refurbished Breightmet Branch Library. Laid Foundation Stone at new Territorial Army HQ, Nelson Street, Bolton March 1991. Unveiled plaque at opening of new Scout HQ, Withins Drive, Breightmet, Bolton September 1990. Hargreaves House, Bolton October 1990. Unveiled plaque to commemorate the opening of Ashness Resource Centre, Withins, Bolton October 1990. Unveiled plaque at planting of lime tree in Nelson Square, Bolton, to commemorate the Centenary of Amateur Soccer in Bolton November 1990. Unveiled plaque at the opening of the refurbished Farnworth Clinic as an Outreach Centre. Unveiled plaque to commemorate the opening of refurbished Bridgeman Buildings, Exchange Street Bolton November 1990. Abseiled down the Town Hall to raise money for the Mayor's Charity. Member of the Auxiliary Fire Brigade. His wife, Pamela, was Mayoress. 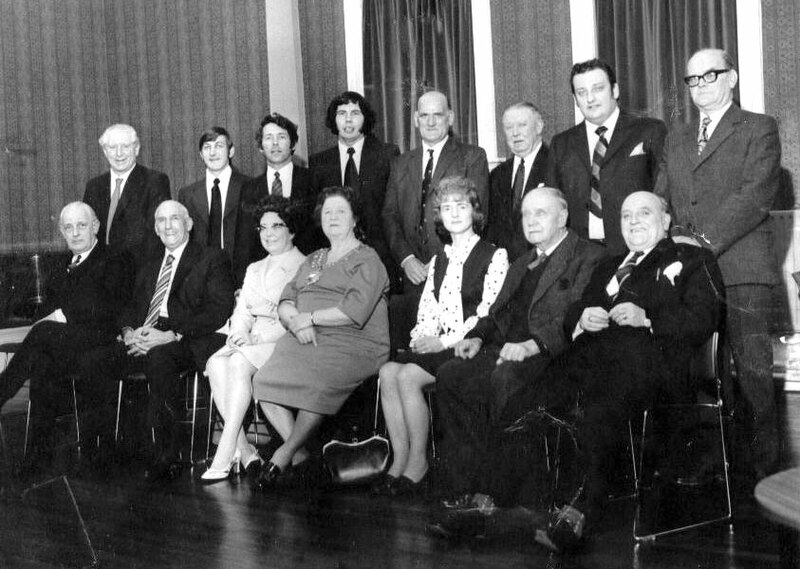 Geoffrey Smith (second from right, back row) in the final group portrait of Westhoughton Urban District Council with Winifred Kettle as Chairman 1974. 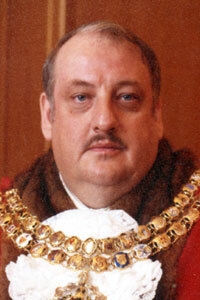 Formal portrait of Geoffrey Smith as Mayor of Bolton. 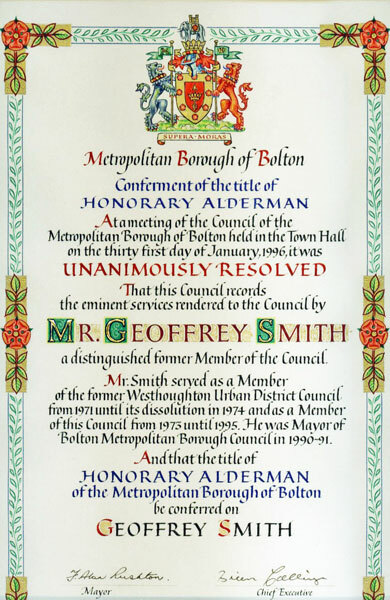 Honorary Alderman scroll presented to Geoffrey Smith 31 January 1996. It was close to 1.00am as I sat in the Mayor's Parlour following the January Council Meeting - the evening of my nomination as Mayor for the ensuing year. As I sat there being plied with the Mayor's Whisky and waiting for the Chief Executive to say the words, 'by fortuitous circumstance Councillor Smith is still within the confines of the building. Is it your wish that I inform him of your decision?, my mind wandered to thinking of my parents. They were born just after the turn of the 20th century, dad in 1904 mum in 1906. My relationship with them was caring and loving but they were from a different era. Having lived through two World Wars and the depression of the 30s they at times found it difficult to come to terms with the so called swinging 60s. Mum, whose name was Alys, left Derby Street School at 13 and her first job was sewing shirt buttons on for piece work at the S.M.C. Ltd. Dad, whose name was Frank, leaving the Deane School also at 13, worked as a little piecer in the Mill which lasted until his 14th birthday - the day he joined his brothers and uncles in the same industry, coal mining. The Victoria Colliery Deane was the pit where he started work underground and where he was to become a Colliery Fireman and Deputy. The very mine where his father, my grandfather Jesse Smith was the Under-Manager, having moved there from the Pretoria Colliery following the explosion of 1910. Jesse my grandfather being the Mining, Tunnelling and Explosives expert who had been seconded to the consortium building the Thirlmere Aqueduct, which was built to carry water from the Lake District to Manchester. The world of their childhood pre-1914 was a time never to return. Mum talked about how in 1914 as a young girl, she, along with hundreds of others, had lined the streets and cheered as the local boys left Fletcher Street Barracks marching to the Railway Station and off to War, most never to return. By this time her father (my other grandfather, Mark Batters) had opened a Grocers Shop on Derby Street, having been forced out of his job at Bessemer's Steelworks and Forge in Bolton for Trade Union activities, having played a part in the foundation of the Steelworkers Union in Bolton. As a boy and teenager I think it fair to say that I was something of a harum-scarum, getting into various scrapes and spots of trouble, and by the time I reached my teens I think dad had, although not entirely, more or less given up trying to influence me. Although when I was approaching 15, and about to leave school, hopefully to become an Apprentice Engineer on British Railways, he said, 'Your life is your own, but let me tell you this; you do not go into the Mill or down the Pit. Those industries will in a year or two be finished', then in exasperation added, 'also try and achieve something you can be proud of. No, better still, something I can be proud of'. He had several what can be described as one-liners, a couple of which were, 'Good manners cost nothing' and 'Put it down to their ignorance'. Sadly he became quite poorly and passed away when I was 20. The man, who could have given me much of the common sense guidance I was to need in the years to come, was no longer there. 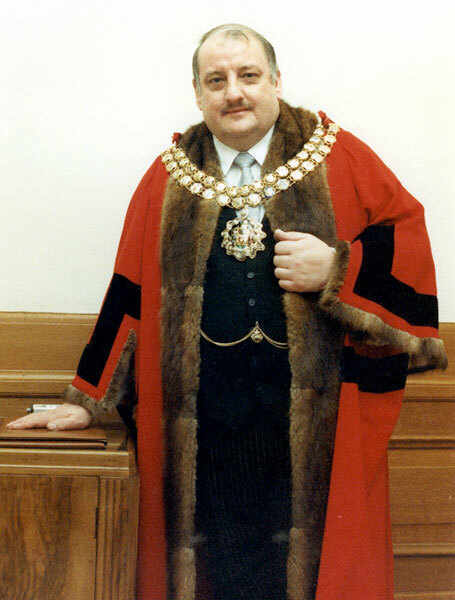 Mum also sadly passed away the year before I became Mayor and, like dad, was never to see me in my robes. 'Best boss I ever had', he retorted, thrusting his hand out and as we shook hands he said, 'He'd be proud of you now lad'. 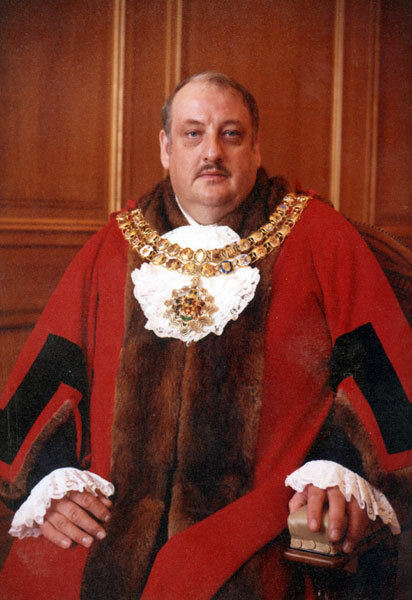 So here I am now, Ex-Mayor and Honorary Alderman of Bolton Metropolitan Borough thinking to myself, yes, perhaps, just maybe, just maybe.